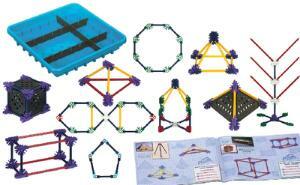 Investigate geometry and mathematics concepts with hands-on models and standards-based student activities. Students live in a 3D world...connect with geometry on a 3D level! Construct squares, triangles, quadrilaterals, rhombi, and prisms with this hands-on building kit, and deepen student understanding with thirteen standards-based student challenges that build upon one another as they lead students towards a greater understanding of mathematics and geometric concepts. Topics covered include shapes, lines, segments and rays, angles, congruence, sides, faces, polygons, 2D and 3D geometric shapes, symmetry, and fractions in a way that's engaging, hands-on and fun. This set supports 3-4 students working as a team and includes a 16-page instruction booklet, plus 44-page teacher's guide. Teacher's guide provides a glossary of key terms and definitions and includes Vocabulary Card masters to support instruction and understanding. Packaged in a strong plastic storage case with transparent locking lid.